Exoplanets: New technique reveals hundreds more alien worlds. The number of known alien worlds just jumped to more than 1,700. They have confirmed an additional 700+ exoplanets orbiting 300 other stars. Ninety-five percent of these planets are smaller than Neptune. One hundred or so are roughly the size of Earth(!!!). Four of these new planets are in their stars’ habitable zone. Like our solar system, these planets orbit in roughly the same plane. Yegads. OK, let’s go over these point by point. First, Kepler is designed to look for planets orbiting other stars by detecting a small drop in the starlight if a planet passes directly between us and the star. This is called the transit method, and it’s been used to great success. However, there are ways these observations can look like a planet is transiting when really it’s something else; a background star changing brightness, for example. For that reason, when Kepler sees what looks like an exoplanet, it’s called a candidate until it’s verified. There are more than 2,500 candidates in the Kepler data! This has created something of a bottleneck in the data, making it hard to confirm planets rapidly. 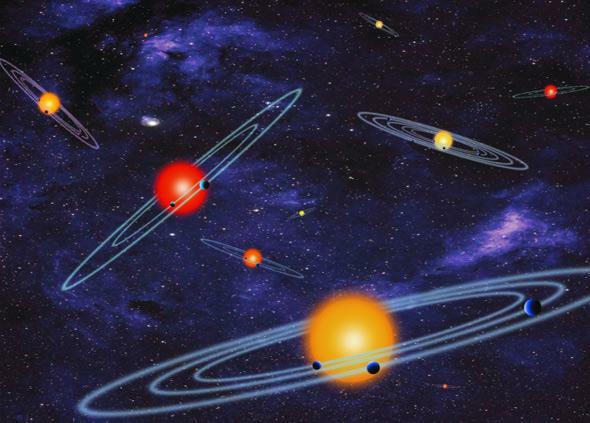 What astronomers did then is pretty clever: Look for multiple planets orbiting a single star. Why? Because you don’t expect to see very many of them if the candidate is a “false positive”; you might see just a handful out of thousands of candidates. What they found instead were hundreds of such planets. They were able to then eliminate the false positives from the sample, leaving a pretty big set of more than 800 planets detected! Of these, more than 700 are newly found. 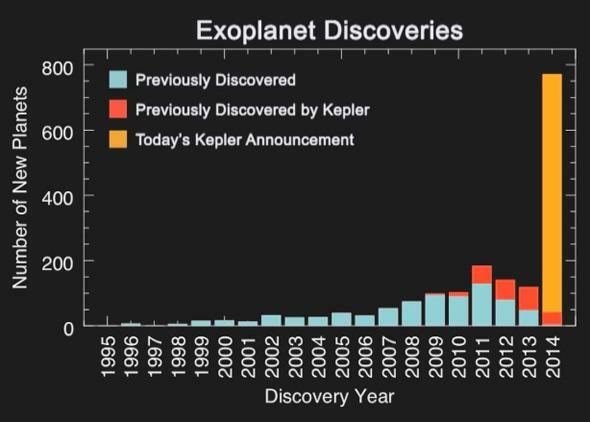 This should give you an idea of how big a deal this announcement is; the total number of known alien planets jumped hugely. The size of the planet can be determined by seeing how much light from the star it blocks. The bigger the planet, the bigger the dip in starlight, and if the star’s size is known (and that can be determined), then the diameter of the planet can be found as well. Of the planets detected in this survey, the vast majority are actually smaller than Neptune (which itself is about four times the diameter of Earth). This is in contrast to most of the previous planets found, which are more like Jupiter in size (10 or so times the Earth’s diameter). Of these, an amazing 106 are less than 1.25 times the diameter of Earth! Previously, only 16 had been found in Kepler data, and only about 20 were known in total (including those found using other telescopes). This is a major jump in known planets that are around the same size as our own world. The number sextupled. Of all the new planets found, four orbit their stars at the right distance to sustain liquid water. This region around the star is called the habitable zone, and it’s really just an estimate; it depends on a lot of factors and has very fuzzy borders. Technically, the Sun’s HZ goes from Venus to Mars, more or less, but we know that Europa, a moon of Jupiter, and Enceladus, a moon of Saturn, have liquid water under a frozen shell of ice. So take the HZ size with a grain of salt; in reality, it’s probably bigger than these conservative estimates. 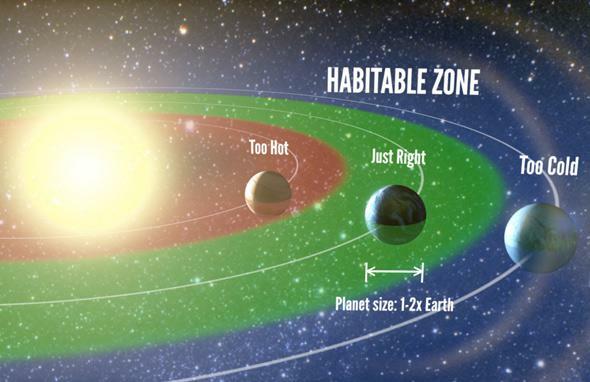 A schematic of a star’s habitable zone, but be aware it’s more complicated than this. Isn’t everything? All four of the planets in their stars’ HZs are bigger than Earth, ranging from 1.8 to 2.5 times our width. We know almost nothing else about them, but just because they’re bigger doesn’t mean they aren’t Earth-like. Surface gravity depends not just on size but on mass, so a lower density but bigger planet can still have very Earth-like conditions. Either way, we can’t tell, so I won’t speculate. The final bit of interesting news is that the planets found orbiting each star tend to orbit in the same plane, much like the planets do in our solar system. Seen from the side, our system forms a thin disk, and the same is true for these other systems as well. This makes it pretty likely that other systems formed the same way ours did. That’s reassuring! All of this put together is pretty striking, and very exciting. We’ve been compiling evidence for years that stars with planets are common and that planets in the galaxy might outnumber stars. These new results support that; multiple-planet systems are common. Not only that, Earth-sized planets are also common, and Earth-like planets may be huge in number too. We think there are billions of them in our galaxy alone. Billions. I’ll remind you: In 1990, we didn’t know of a single planet orbiting an alien star. Not one. Just a few years later the first was discovered, and now we have confirmed the existence of more than 1,700! Mind you, these new results only come from using the first two years of Kepler data; when the technique is applied to all four years of data there’s no doubt a new treasure trove of planets will pop out. The Milky Way, the whole Universe, must be fairly buzzing with planets. Billions upon billions of them, just waiting to be discovered. This new technique shows we can find them, even better than before. As time goes on we’ll build better telescopes, better detectors, and find new methods that will make this even faster and better. This is truly a magnificent time to be alive, and to stretch the realm of our knowledge ever farther. Correction, Feb. 26, 2014, at 20:00 UTC: I originally wrote that the number of Earth-sized planets quintupled. However, since 20 were known, and an additional 106 were found, the number more than sextupled.